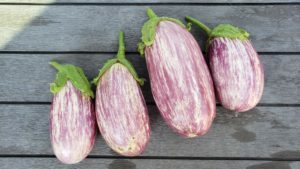 In the plant profile series of videos, today we will look at growing the Listada de Gandia eggplant (Solanum Melongena) we will look at how to grow this eggplant variety in raised beds and we also have a delicious recipe for you! 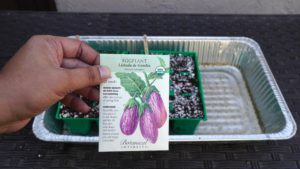 Eggplants are summer vegetables and we recommend that you start eggplants in seed starting kids 6 to 8 weeks before you plan to transplant them. 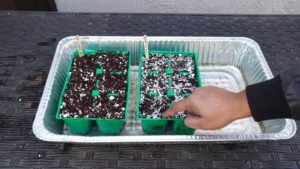 We’re starting our seeds here in January in Southern California and the seed starting mix that we have used is a combination of peat moss and perlite and this makes a great seed starting mix and all you do is sow one or two seeds per cell. When the plant is about 4 weeks old, you can add a weak fertilizer to fertilize your seedlings, you can even use compost tea. Eight weeks since sowing the seeds we are now ready to transplant our seedlings on a raised bed. Eggplants need about eight hours of Sun a day they need full Sun. 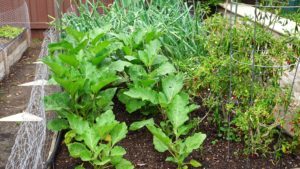 When the plants are starting out, you need to provide it with a lot of high nitrogen fertilizers so that it can develop good foliage and once they start flowering you need to switch to a low nitrogen fertilizer. Eggplants as well eggplants prefer a pH of about 5 point 5 to 6 and you can do a soil test to determine your soil pH. Pruning is a very important step that you need to do for your eggplants and what you need to do is prune the suckers which come out from the bottom part of the eggplant and you might not see these till like plant is about four feet or so tall and once you see these suckers coming out you need to make sure that you remove them they’re useless parts of the plant they don’t have any use they just use the energy from the plant to produce leaves which we do not want for your eggplant so just make sure that you remove the leaves from the bottom as well the dead leaves and the suckers that you see. Eggplants are very susceptible to spider mites so pruning and removing dead leaves from the bottom help prevent the spider mite issues with most eggplants. 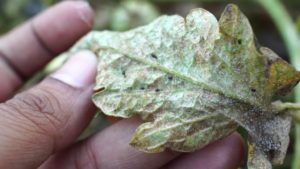 There are a lot of ways to take care of these diseases one of them is to use a spray an organic spray that takes care of all the pests on the eggplants like spider mites and aphids and all the other pests you can also use neem oil if you want to kill all these pests that come on these eggplants. There is no right or wrong time to harvest the eggplants. 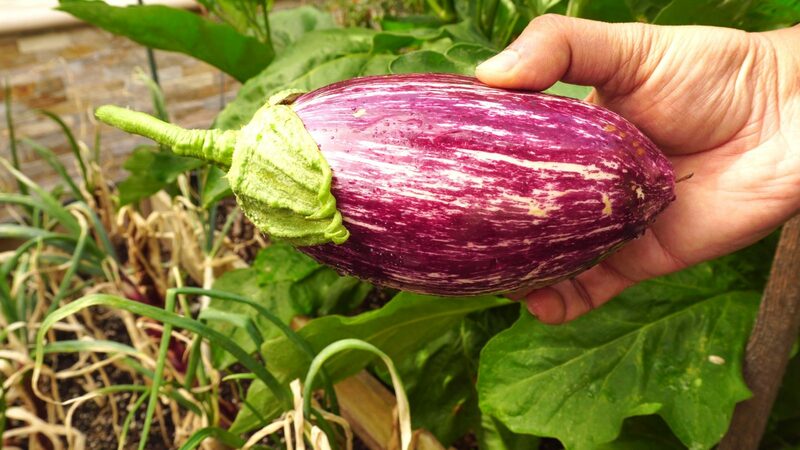 The eggplants do get very big, but no matter when you harvest it you will be able to enjoy your eggplants whether they are small or whether they are large there’s no real right time as such to harvest the eggplants. You can usually wait till the eggplant is quite sizable so that at least you can use the eggplant for preparing any dishes you like! Take a pan and heat some oil in it and inside this pan. Add some mustard seeds, some lentils. 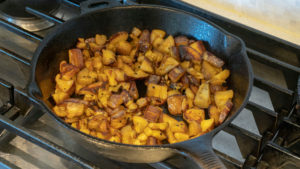 Add the diced eggplants and after you add the eggplants make sure that you stir them very well and this will help them absorb all the oils that are there on the pan and all the spices. Do not cover the pan because eggplants have a lot of water in them. Make sure that you keep stirring them throughout this process. And it’s really a very simple recipe you just keep stirring them you can add a little bit more oil if needed but if you don’t like a lot of oil if you want to just avoid using a lot of oil you can do that I like to shallow fry it a little bit so that they very crispy and crunchy. So there we have it folks that was our episode on the plant profile for the listada de gandia eggplant let us know if you have tried growing this eggplant variety before! Happy Gardening!